From business and planning perspectives it is important to understand what the probability is of completing a project either early, on time or late. High probability of completing the task: Time estimates under this category have a large safety margin and can result in the work for the system/project taking much longer than actually required to do a reasonable job. 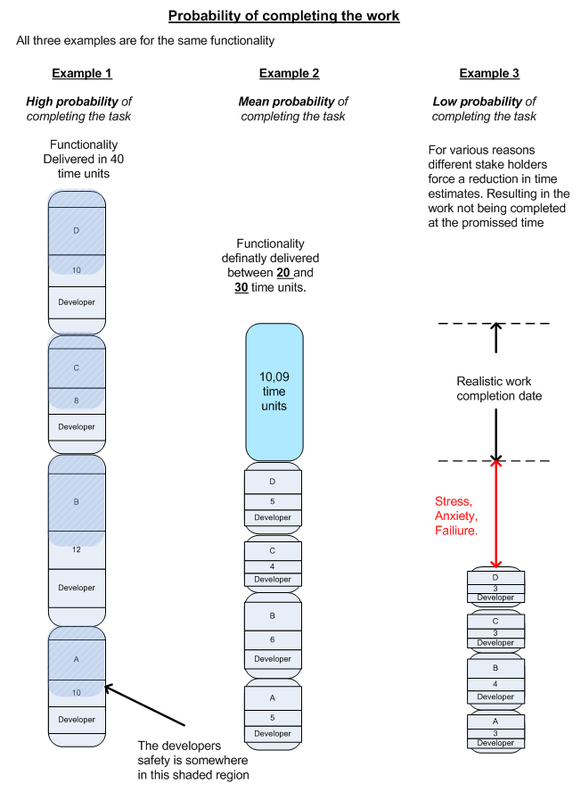 Mean probability of completing the task: The time estimates under this category will generally result in approximately half of the Tasks being finished in less than the estimated time. The other half will take more time than estimated to be completed. Low probability of completing the task: This is an optimistic time estimate and it is likely that no tasks will be completed in the estimated time. Therefore the work group/project will be delivered later than estimated. The illustration below is to shows the three levels of probability relating to time estimates for four stories or user scenarios a, b, c and d. Each story is represented in the three different time estimates starting with story a at the bottom and story d at the top of each column. How can we use these probability definitions in every day project, programme and portfolio management? By having a clear definition and understanding of these probability estimates, we are able to communicate and understand how estimation of effort on projects is impacting the business. You can then use this information to make well informed business decisions. No further action is required as the estimating system is working. From a business perspective these estimates are costly due to loss of trust. The blame game will likely kick and a reactive culture rather than a proactive culture develops. If we have a process that results in optimistic estimations and therefore a low probability of delivering on time. Management has the opportunity to invest in identifying the root cause(s) and resolve them. •	Sufficient time is not allocated to developing and understanding requirements before effort estimations are done. •	Arbitrary estimates are made to suit some fictional total time that has been sold in. To make corrections for optimistic estimates in an existing project. Calculate the total effort of work done so far and divide it by the estimated effort for the same work. Increase the remaining work by the percentage difference. Remember that this need to be continuously monitored throughout the remainder of the project. At the organisation level, embed a culture that enables people to learn from mistakes and make improvements. This will help create a proactive and progressive organisation that is able to continuously improve. From a business perspective these estimates are costly due to lost opportunities in delivering more throughput and business value. It is important for management to allocate time and resources to optimise the throughput and resolve the underlying cause of the higher estimates. Experience shows that people will move towards high probability estimates to protect themselves. The reason why they want to protect themselves can have several causes. •	In the past they have had a negative experience in projects that have overly optimistic estimations and want to protect themselves from a repeat experience. •	One company is entering into a fixed price contract with another and wants to create as much of a buffer as possible to reduce the possibility of incurring a loss. To make corrections for high probability estimates in an existing project. Carry out a similar exercise as you would do for optimistic estimates. In this case the total delivery time is likely to be reduced. At the organisational level, take the time to train people to estimate effort in a project and reward teams who are able to improve throughput at the right quality.